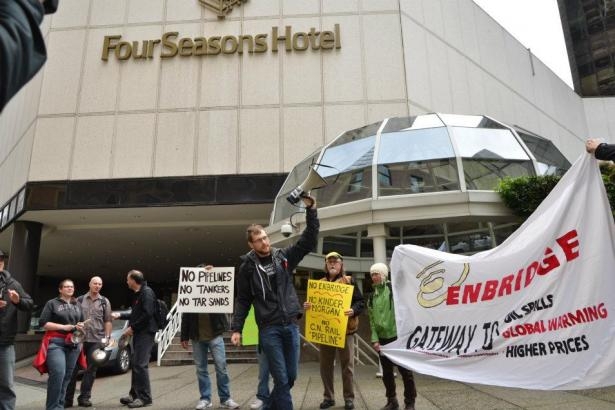 While oil and gas industry experts were speaking at the Canadian Oil and Gas Export Summit at the Four Seasons Hotel, around 40 people outside the building were loudly protesting the proposed Enbridge Northern Gateway pipeline on Wednesday morning. Chants of "No tankers, no pipelines, no tar sands," filled the air near Granville and West Georgia street. 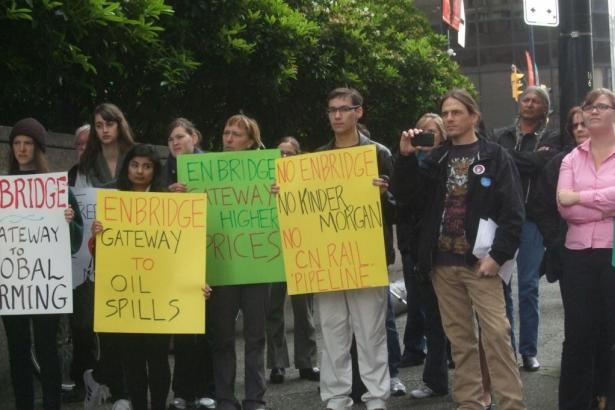 The rally, led by Occupy Vancouver Environmental Justice Group, aimed to raise awareness about the proposed Enbridge pipeline from the Alberta tar sands across the Rocky Mountains and through British Columbia to Kitimat. Among the speakers at the conference was Paul Fisher, vice-president commercial of the Northern Gateway Pipeline. 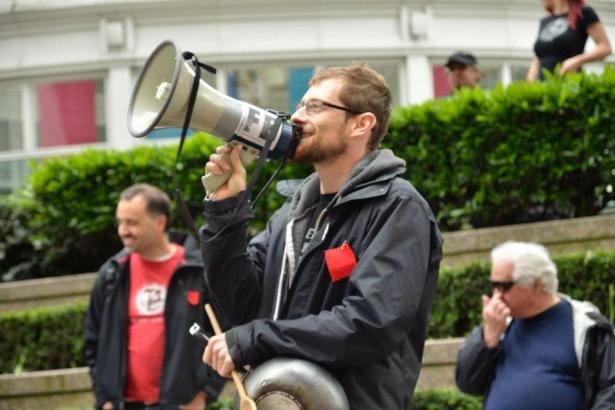 "This Canadian Oil and Gas Export Summit is about oil industry meeting looking at how to keep getting the oil and profits out of Canada when more and more Canadians aren't happy with this idea," Occupy Vancouver activist Stephen Collis said. 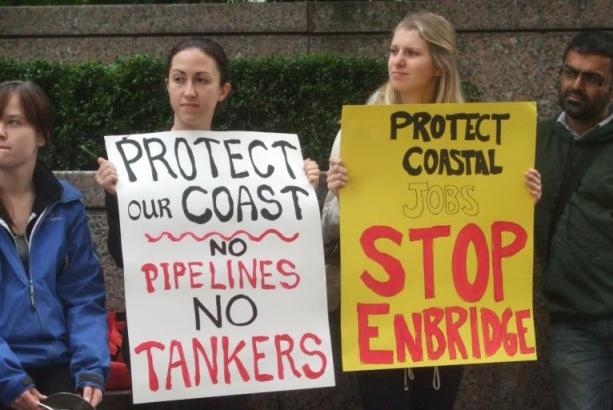 Protesters were holding banners with slogans like "Enbridge, a gateway to oil spills", "Protect our coast. No pipelines no tankers" or "Enbridge to higher prices." "Yet again, this is about profit of the 1 per cent and consequences for the 99 per cent," Collis added. During his speech he mentioned the long term consequences of the pipeline, comparing what he termed "short-term private games" versus "long-term public headaches." 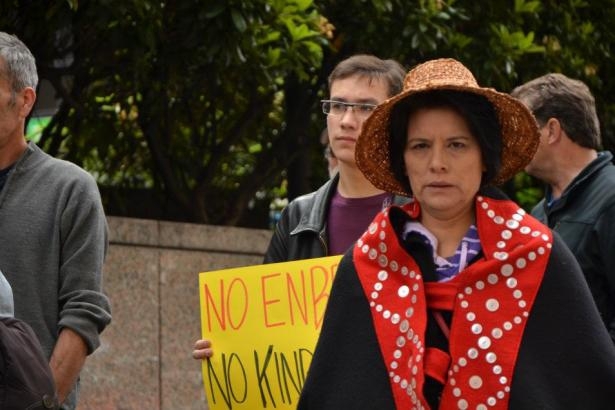 First Nations representatives from Musqueam and Squamish nations also showed their opposition to the proposed oilsands pipeline during the protest asking British Columbians their support to protect the land. Some protesters were wearing traditional indigenous attire. "Government and the industry are trying to convince us of the idea that the Canadian economy boils down to one thing: oil. And that just is not true," Collis said. "They like to speak about the Canadian oil industry; the reality is a global multinational industry but in this situation this happens to have a Canadian location for its extraction and for the pollution." "Our goal is to raise awareness around the issue and the harm that pipelines will do for general environment, and make our presence felt," Suresh Fernando, Occupy Vancouver Environmental Justice Group Environmental Justice Group activist, said. ForestEthics representative Jolan Bailey highlighted the economic side of the pipeline debate. "[The Government] strategy is to picture all the debate into a frame of environment versus economy. They are saying that people that defend the resources that we depend on, like us, are anti-jobs." 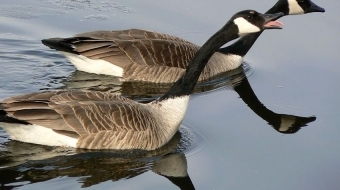 Bailey referred to a report from former ICBC economist Robyn Allen, which challenges Enbridge's economic models and shows that the Northern Gateway project would cause job loss in the manufacturing sector and widespread inflation. 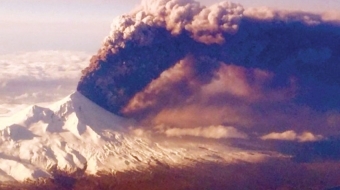 "Studies show that the risks to jobs and the environment outweigh any possible economic benefits," Bailey said. After every speech, protesters banged pots and pans. Many wore red squares on their lapels, the "Maple Spring" sign from Québec students who are opposing the tuition hikes proposed by the provincial government. Some mentioned the student protest in Quebec as an example to follow: "people waking up and coming together." "We want people to get involved with us," Occupy Vancouver activist Sursesh Fernando said. Voters Taking Action on Climate Change -- a group of people from Vancouver concerned about global warming and engaging people politically -- has organized a beach photo shoot at Kitsilano beach on June 3 at 4 p.m. The “Put yourself in the picture” event will be for an ad in support of the anti pipeline campaign where people can appear in "the big picture" and "call on Premier Clark to say no to tankers and pipelines."